Back in the furore of the Detroit Auto Show, there was one vehicle that almost faded into the background. And you could consider that quite a surprise, as the vehicle comes from one of the world's most esteemed and leading manufacturers: Mercedes. The brand-new GLE Coupe is a sporty looking vehicle with a professional and sleek exterior, it is in fact, very unlike any Mercedes currently on the market. This will presumably be it's main sellling point, and it's quite a point to lead out on. The Mercedes brand-name carries a colossal weight around the world, and though very little is known about the GLE it's mere identity gives it a headstart over it's more understated competitors. All of the vehicles will have four-wheel-drive fitted as standard. The basic GLE 350 packs a 3.0-litre V6 diesel engine offering 358bhp and 457lb ft, these are impressive stats but if they're not quite upto your standards then fear not: There are three options to choose from, with the 400 providing an alternative twin-turbo powered engine that in-turn offes slightly less on both fronts: 333bhp and 354lb and the 450 AMG the stand-out performer of them all. Offering 367bhp and 384lb ft it outdoes it's cousins on almost every front, and considering it shares the same engine as the 400 makes it incredibly more impressive. Speed demons will be delighted with the news 0-62mph is attainable in about 4.2 seconds, and top speed of 174mph is certainly something to shout from the rooftops about. However, in order to reach these incredible speeds you'll need to have the AMG Drivers Package. Airmatic Suspension, and a Dynamic Control System, managed via the centre console which boasts five separate ransmission modes: Individual, Sport, Sport+ and Slippery. There are expected to be a wealth of safety features on offer, as well. 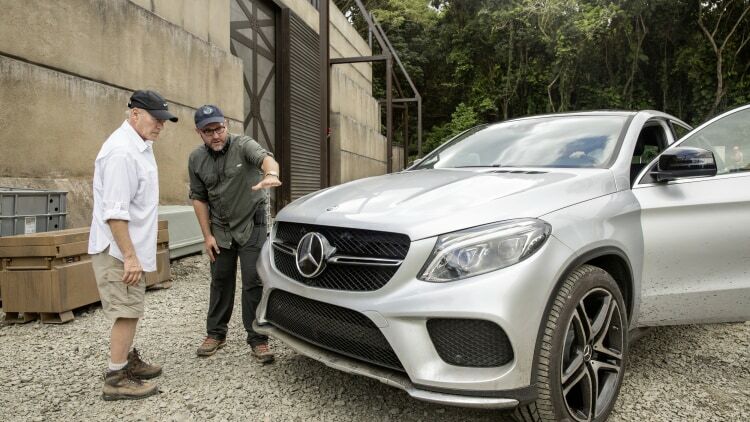 Movie fans will get a closer look at the vehicle as it tackles the prehistoric in the latest itteration of the classic Jurassic Park films, Jurassic World. The GLE packs-a-punch and looks fiersome too, with a stylish grille and bold exterior, however, the odds might be stacked against it when facing a bit of dino-destruction. The interior looks fluidly styled and smoothly designed with what we've been told is a genuinely expansive range of space and sports-geared practicality. Mercedes will hope that sports seats ''man-made'' will not be their nadir, and the GLE is set to glean many of it's hair-raising features from Mercedes' extensive range including the C and E Class. That means steel sport pedals and a nifty carbon-fibre trim. The motoring world will continue to wait with bated breath for more information, and while it could be some time it's fair to say Mercedes will - if they haven't already - build up a signficant support base for their most recent addition to their growing family. We have all of Mercedes' extensive current range, available at a strongly affordable monthly rental. Leasing has been advocated by some of the countries leading motoring outlets, and is the most effective medium of securing a brand-new car. Our sales advisers will be delighted to assist with any vehicle queries you may have. Visit: Mercedes Business Lease, email: info@selectcontracts.co.uk or call: 0845 6770 770.